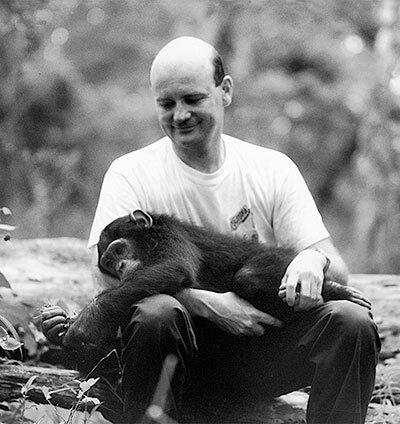 In 1989, Stephan Louis founded Chimfunshi Verein zum Schutz bedrohter Umwelt e.V., a non-profit organisation with the aim of supporting the Chimfunshi Wildlife Orphanage. The German charity ‘Chimfunshi Verein zum Schutz bedrohter Umwelt e.V’ (Chimfunshi Association for the Protection of Threatened Environments) commits itself to the protection of endangered chimpanzees and supports the Chimfunshi Wildlife Orphanage Trust in Zambia. Chimfunshi Wildlife Orphanage Trust in Zambia, and the Chimfunshi e.V in Germany, work together to preserve and develop Chimfunshi’s environmentally important conservation area within the framework of a general concept. This involves, on the one hand, protection of the chimpanzee species by providing a home to poached and orphaned chimpanzees and on the other, to protecting and conserving the indigenous environment and its flora and fauna. The protection of the natural environment and its fauna and flora is an important part of the holistic concept of Chimfunshi – as is the support and development of the local community, including provision of child & adult education and training, employee career development; and health care to Chimfunshi’s local community. Purpose and Goals of Chimfunshi e.V. engage in exchange with other chimpanzee sanctuaries and scientists around the world; facilitate field studies at Chimfunshi. Further information can be found in our brochure, which you can download here. In 1988, Hamburg entrepreneur Stephan Louis discovered the Siddle’s orphanage and has since been actively committed to Chimfunshi. He founded the Chimfunshi Verein zum Schutz bedrohter Umwelt e.V. in Germany that same year and, together with numerous donors, provided significant financing for the project. Thanks to the financial support from Germany in the early days of the association, the sanctuary could be organised internally and the first employees hired, which allowed additional chimpanzees to be accepted into the orphanage. The first outdoor enclosures and feeding buildings were created and an initial inventory of vehicles, equipment and machinery was purchased. In addition, five wells were drilled to ensure a supply of clean drinking water for Chimfunshi. The acquisition of the Siddle cattle farm by Stephan Louis, who transferred his ownership to a Zambian trust, was intended to support the work with the chimpanzees and also to make the chimpanzee sanctuary self-supporting in the long term. Stephan Louis sadly passed away unexpectedly and at the much-too-young age of 57 on 25.7.2011. His vision and commitment led many chimpanzees to be saved and given a home whilst ensuring a living for several hundred people in Zambia. Since 2012, Stephan Louis’ brother Sebastian has continued his brother’s legacy as the new Chair of the Chimfunshi e.V. board. A small school, staff residences and additional wells have since been built at Chimfunshi. All of the facility’s machinery and vehicles were either replaced or repaired and a number of donations in kind (clothes, toys and school materials) have been accepted. In addition, cooperation with international scientific institutions has been expanded and an organization for volunteers was opened in cooperation with African Impact, which organises volunteer work for projects in Africa and contributes to the income of Chimfunshi Zambia. With every purchase in our shop you support our projects.